The Mediterranean... The green and a little white ball... The strong aroma of thyme... aged pine trees... experience golf in North Cyprus. Northern Cyprus has a magnificent golf course and country club in Esentepe, Kyrenia where everyone can enjoy a play of golf. 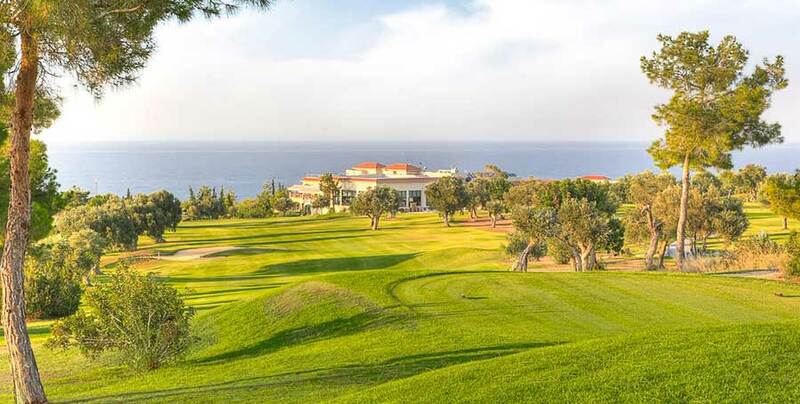 Cyprus is an ideal place for golfing holidays where you can play golf all year round. Combination of sun, sea and cultural tourism makes Northern Cyprus a wonderful golfing destination for many golfers. The Mediterranean... The green and a little white ball... The strong aroma of thyme... olive trees... Myrtle... Atlas… pistachio... aged pine trees... with the hilltops of the five fingers, the Toros mountains opposite and the Mediterranean sandwiched in between... the enchanting dance of a small white ball on the infinite colours of green... a place where quality and prestige meets... THE KORINEUM GOLF COURSE. The course takes its name from the old name of Girne. The Korineum Golf Course is set in an area of striking natural beauty, and has been designed in such a way that it improves and protects the natural beauty of the area. Located in Esentepe, about 15 miles east of Kyrenia, Korineum Golf Club is 18 hole championship golf course with a unique design. The total distance of the golf course is 6,232 metres, 72 par gem designed for golfers of all standards and ages. There are 37 golf carts available who don't want to walk. No doubt you will be amazed with the magnificent setting, combined with spectacular views, a charming atmosphere, the sun shine and a nice breeze from the sea. The golf course offers facilities including an academy golf course, driving range, a restaurant with amazing view of golf course, a boutique hotel, villas, swimming pool, pro’s-shop and members lounge. It has something for everyone, whether it be relaxing in one of the terrace bar, dining in one of the restaurants with perfect settings, healing your mind, body and soul in the spa centre, treating yourself to some pampering in the beauty salon or visiting the Fitness Centre/Gymnasium. In addition to the excellent 18 hole Golf Course, there are 4 clay tennis courts with lighting facilities. If you would like to experience a golfing holiday of a life time, then North Cyprus is the newest golf holiday destination in the world and offers a cost effective travel to suit your individual needs and budget.